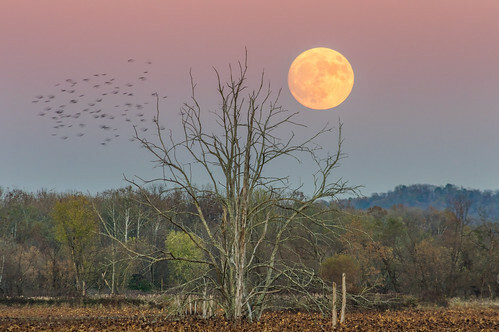 The marsh of Green Bottom, West Virginia comes alive in the warmer months, but the swaths of lilies die and wilt, colors fade to brown, large, bare trees take on the form of mythical creatures and a lifelessness begins to envelop the land through the transition from autumn to winter. Occasionally there are signs of life for a brief few moments such as this one. A once in a century full moon hangs above the hydra of the swamp and a flock of birds fly across the horizon to take roost for the evening in the opposite direction, while the setting sun creates a colorful palette mixing pink pastels and blue earth shadows, all for a moment before the lifelessness takes hold again.